The Epson Workforce Pro is a professional high performance but low running cost range of Printers. For the easiest print management system together with lowest pricing click this link. With laser-like looks and performance, combined with reliability and significantly lower running costs, Epsons WorkForce Pro WP-4500 series is engineered for business. Businesses can now have it all: less cost and more speed.This high-speed inkjet all-in-one offer demanding businesses a genuine alternative to laser that can save up to 50% on the cost of color printing. The series offers further savings with a super-fast automatic double-sided printing function, reducing paper usage and costs by up to 50%. Businesses can also benefit from lower ink costs thanks to a choice of high-yield cartridges. ENERGY STAR-qualified reduced power consumption brings additional cost and energy savings.Sharp, business-quality documents featuring both text and graphics are delivered at a fast print speed of 16 mono pages per minute and 11 color pages per minute, and the print resolution of 4800 x 1200 dpi is much higher than comparative lasers. We are recommending these printers together with the Epson Managed Print Services as the ideal printing solution for low cost but high quality printing with excellent warranty and support service. The above printers come with a 1 year on site warranty. We would recommend an upgrade to 3 year on site warranty at only €125 + VAT. The 4515 would be our recommendation for classroom use. 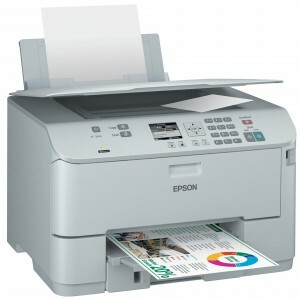 When purchasing any of the above printers and opting for the Epson Print Managed services you may opt for a 20% discount on both printer and warranty OR your cost can be spread over the duration of the contract. For example the WP-4515 DN together with the 3 year on site warranty would cost you ONLY €10 + VAT per month over the 3 years of the on site warranty service meaning no further printer decisions and lowest cost printing.